Hello again from sunny Singapore! This weekend I was inspired to do something a little more akin to what the name of this blog suggests. Big Green ASIAN Egg… So I looked for a recipe to try out that was anything but standard. Now you have to understand that our family are “rib connoisseurs” and when I suggest something new, eyebrows are raised as if to say, “if it isn’t broken, why fix it?” That’s the fun in trying something new. So for the brave, here’s an Asian inspired recipe that will surely please your friends when you suggest going off topic! Combine by whisking the above ingredients, except for the ribs of course, in a medium sized glass bowl. You don’t want a reactive metal or a white plastic bowl as it will definitely stain. Once done, reserve about 3 or 4 heaping spoons of the marinade for later. Leave it covered at room temperature. Now take your ribs, slice each rack in half and place them into a double bagged set of zip-top bags. You need to as the ribs are likely to punch a hole through the plastic. Having a second layer is just good insurance. Spoon the thick, dark, tasty mixture into the bag and make sure you coats all sides of the ribs. Give it a good massage and then place the bags into a bowl and into the fridge. Normally I’d leave it overnight but alas I only had an hour before I had to put them on the grill. Still tasted amazing despite the hour long marination. Set up your grill for indirect heat and place a water pan under the grid. This helps with catching the drippings but also provides a humid environment, leaving your ribs incredibly moist and juicy. I used a handful of plum wood chips for this recipe. You can use anything you like but go easy on the smoke. Remove the ribs from the bag and place them on a raised grill rack. All four will fit nicely. 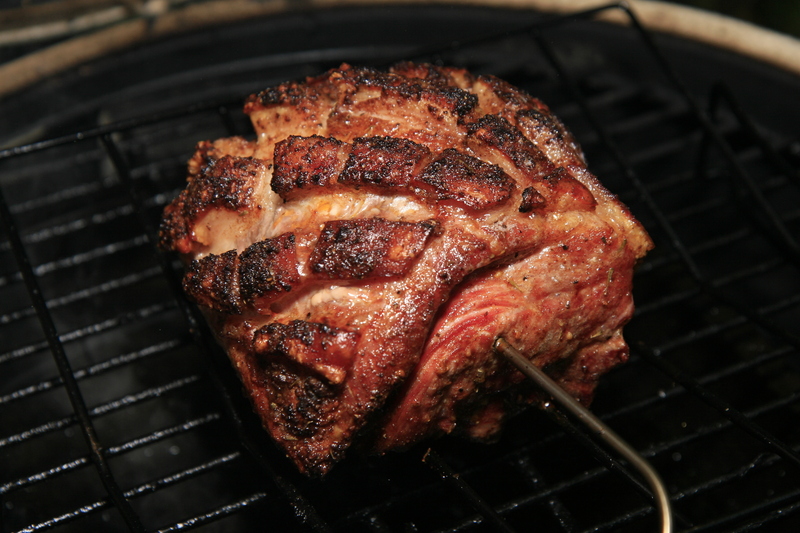 Set your ambient temperature to 225F (107C), place the ribs over the drip pan and close the lid. You’ll let these smoke for 2 hours. 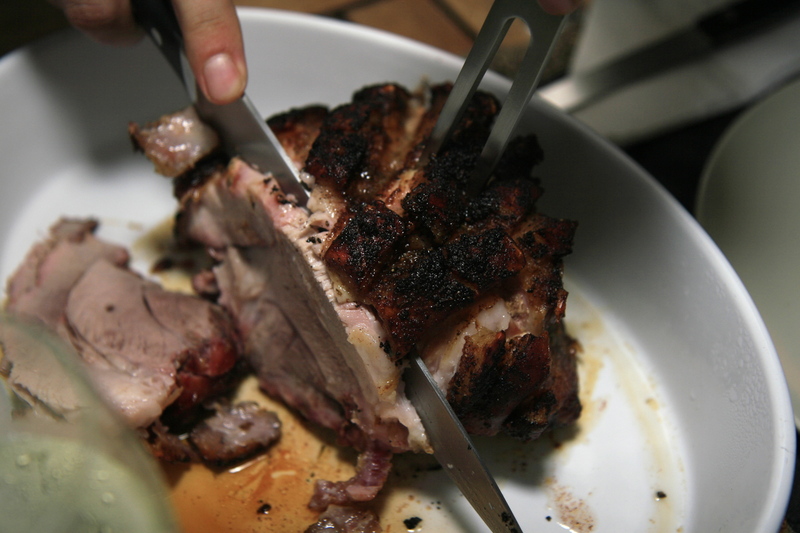 Once done, carefully take the grill rack off the grid and wrap each rib section in a double layer of aluminium foil. I added a bit of apple juice to each packet for extra moisture during this stage. Now place the packets back onto the rack and back on the grid. Again, keeping a temperature of 225F (107C), close the lid and let them steep for 1 hour. When the timer pings, remove the rack and carefully open each of the packets and place the ribs onto a place. Careful here as there’s a lot of steam and juices that will remain in the packet. Save that for basting! It’s ok to leave the ribs sitting uncovered for a while while you fire up the grill to SUPER HOT! Using my trusty grill grates, I set the internal temperature up to about 500F (260C) for the final stage. When you’re ready, place the ribs meat side up onto the scorching hot grates. Keep your dome open during this stage as you don’t want the ribs to burn. Give the meaty side a baste with the marinade you set aside earlier. Keep flipping the ribs until you get a really nice char on both sides. Again, careful not to burn the sauce! We served the ribs up with a radish, beetroot, carrot miso slaw and grilled corn with lime, mint, parmesan cheese. The result was amazing! I got dinged on overall points because Heather ended up taking a fatty chunk of ribs. She’s not a fan of fatty ribs and neither should you! Not every rack of ribs will be award winning. Personally, I loved these ribs. They were juicy and super messy to eat. Great fun if you just don’t care about making a lip smacking mess! Previous PostVeggie Burgers – Who Knew? This looks delicious. The BGE is popular back home in Canada (especially this weekend as it is Thanksgiving weekend in Canada, which is different from the US, and many families are dropping a turkey onto their BGEs after 12 hours in a brine and I am incredibly jealous) but I have not seen them for sale in Singapore. Are these available here in Singapore yet? Even the small ones? Keep posting and I’ll keep looking on, in envy. Thanks Tyler and happy thanksgiving to you! I’m watching the Leafs and giving thanks! Sadly you can’t get the eggs here yet but I’m working on that. Stay in touch mate! I miss this blog. Such a shame that it just went silent.